Markahuasi Has To Be Seen To Be Believed! It has been dubbed the playground of the Gods. 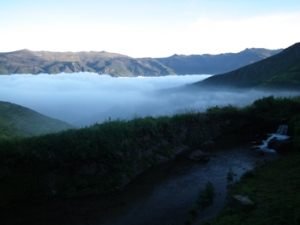 High in the mountains, 88km from Lima, Markahuasi is yet another strange phenomenon in Peru. 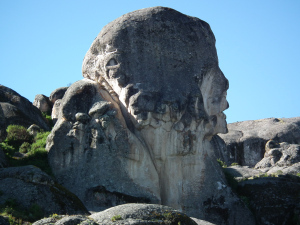 Unusual stone formations reveal the faces of people and animals from overseas countries carved rock. They shouldn’t be there. Mainstream archaeologists claim the rock formations are naturally formed and dozens of rocks that appear to originate from the four corners of the earth are merely a coincidence. If scholars say the rocks have been weathered by time, it must be true right? But when you go and investigate the “phenomenon” for yourself, the rocks tell a completely different story. Look at the photograph below – does that look like a rock that has been shaped by the elements, or craved from man´s chisel? In Lima, I met several locals who said the rocks at Markahuasi were natural formations. They had never been there to look for themselves, they were just repeating what they had been told! If you are in Lima, a trip to Markahuasi will be the most interesting two days you have in the Miami-like metropolis. It’s a bit of a trek, but well worth the visit. At least, it was for me! To get to Markahuasi from Lima, I took a shared cab (collectivo) to Chosica for about eight soles (2GBP) then a bus to San Pedro de Casta up in the mountains. This is your starting point for the 2-hour hike to the peak where you find the sculptured rocks of Markahuasi. There are only two buses a day up to San Pedro, one in the morning, another in the afternoon so an overnight stay is required. 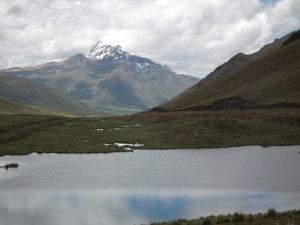 On the day I went, the bus left at 3pm, though Peruvian bus timetables have a tendency to change at random. By the time the bus had made the slow four-hour venture up a windy mountain dirt track, it was dark. Finding a bed for the night is not difficult. There is only one hotel. And it has 18 rooms. The spacious dining room looks to sleep about 29 people so unless an organised tour bus is booked in on the day you arrive, I would say you have a good chance of getting a bed. Given the place has an air of Miss Haversham’s about it, you shouldn’t need to book in advance. According to local legend, there is a portal that can take you into another dimension. 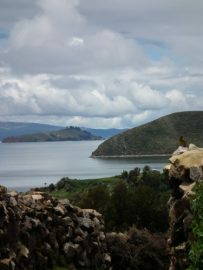 There is a similar legend in the villages of Puno around Lake Titicaca which you can read about here. When I was in San Pedro, I met an English woman who called herself, Belle Skywalker. 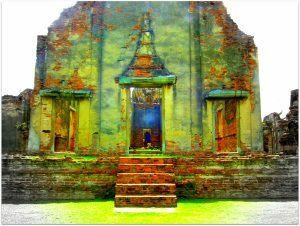 She was visiting Markahuasi in search of the portal – or at least to experiment whether the doorway could help her expand her consciousness. I arranged to meet Belle at Markahuasi the next day, but she didn’t show up. 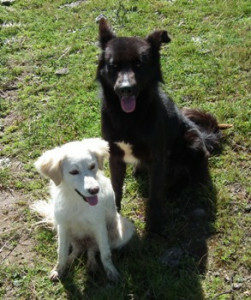 I set off at 5.30am and was accompanied by two dogs that had greeted me outside the hostel. They seemed to know where I was going and led the way – looking back occasionally to make sure I was following. Daylight was breaking in and within half an hour the sun began to rise over the peaks of the mountain tops. The scenery was magical and got better the higher I went. Clouds gathered between the crevice of the mountain and it wasn’t long before I was looking down at them several hundred feet below. On the way up, a couple of mountain dwellers were walking their donkey´s up the path. The dogs went crazy and chased after them, causing the poor beasts to panic and charge off down the hill. Percy and I had to dive out the way. Later they chased a bull of the path. I got a few disgruntled glares from the cattle owners – and they’re not even my dogs! I had hoped to meet Belle in Markahuasi, but instead of the somewhat eccentric English woman, I met a psychic from Belgium. John told me about his experiences in different dimensions and how he was taught about a new consciousness on the other side. His story sounded very much like Dr Meg Blackburn-Losey’s book, “The Secret History of Consciousness.” It´s a fascinating read albeit over-embellished. At the entrance to Markahuasi is a giant rock. 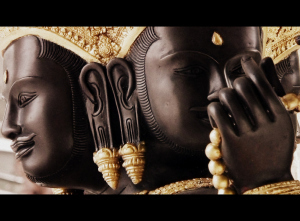 In it, is the carving of a face. “That is the father spirit,” John told me. “It’s a totem.” As I got closer I could see there was not only one face, but two; one on the front and another at the back. 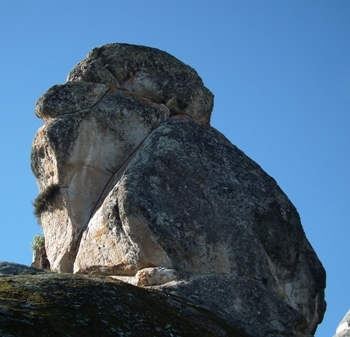 On the right of the rock is a carved face that looks European, and to the left, appears to be an Arabic looking face. Not only that, but between the two faces along the side of the rock were another half dozen smaller carvings, also of faces. If Columbus discovered the Americas in the 15th Century and the Spanish only arrived in Peru in the early 16th Century, how could the faces of Arabs and Europeans appear in mountain rocks? The Inca typically carved items that were centrally important to their culture into their monuments, ceramics and weaving etc. I found numerous rocks that reflected this at Markahuasi, particularly snakes and birds. Other investigators have also found animals that are not indigenous in Peru, but Africa; a camel, a lion, a turtle and Queen Nefertiti of Egypt. Watch the documentary at the foot of this article and see for yourself! 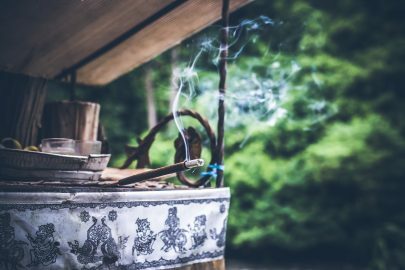 “Markahuasi was used by the ancients to develop their conscious awareness,” John told me. “It´s a place to expand your brain.” The rocks here emit an extraordinary amount of electromagnetic energy. 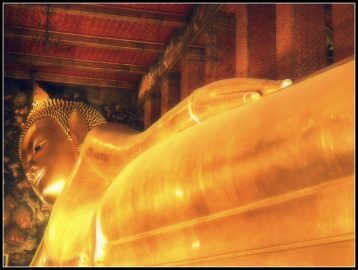 When I meditated against one, I could feel the force pulse all the way into my forearms and my hands went numb. The images I saw in my mind´s eye were extremely vivid. Moving on we came into a clearing between the rocks where two donkeys were grazing peacefully. The dogs spotted them and tore off in pursuit, barking frantically. My demands to come back were ignored and they disappeared over the brow of a hill in pursuit of the donkeys. In the distance, I could hear the panicked shrieks of the donkeys, hee-haw, hee-haw. Later we stumbled across some ruins that looked very much like Inca constructions. I asked John if he could sense the presence of Inca. “No. I feel the energy of the Tiwanakans.” He told me the Aymara were much more in tune with nature than the Inca and their energy was more profound than any other culture in the Andean region. “Sacred sites are not being used in the right way and are projecting negative energy,” John told me. “The energy at Machu Picchu has all been drained by tourism. It’s attracting the wrong type of people.” Having already been to Peru´s biggest attraction, I knew exactly what he meant. A mist was descending over the mountain and we could barely see the rocks in front of us. John’s guide knew a short cut back that would shave our journey by an hour. We scrambled down to the bottom and had just enough time for lunch before the bus departed. The dogs joined us on a small veranda outside so we fed them tidbits of spaghetti and chicken. Even in the end as the bus pulled away the dogs were there to chase us goodbye. We hee-hawed. 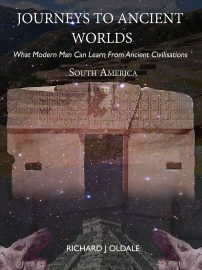 You can learn more about the mysteries of Peru in my book Journeys to Ancient Worlds: What Modern Man Can Learn From Ancient Civilisations. To find out more about Markahuasi, watch the video below. Thank YOU!!! You brought me on the journey with you…and I so needed that bit of adventure this evening. 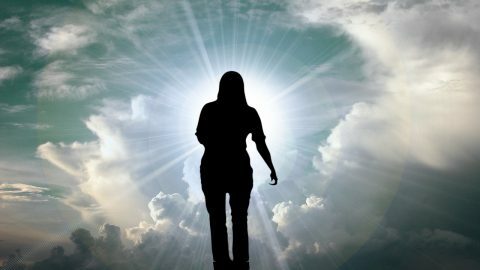 ♥ I’m quite interested in energetic portals and gateways of transformation…so I will definitely look forward to watching the video too. Many blessings to you!! !